Sitecore Experience commerce 9.0 Update 3 was released today (December 4th 2018). 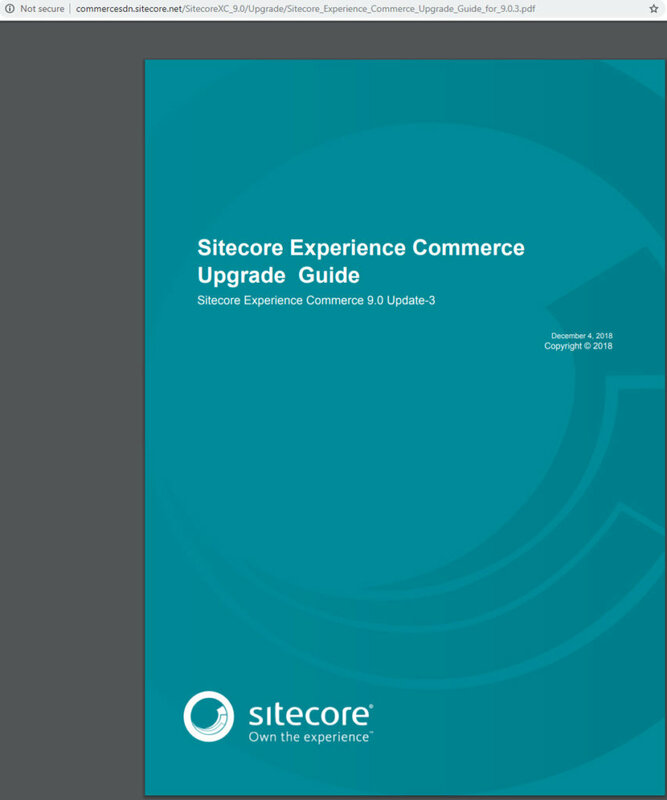 This post outlines the process of upgrading Update 2 to Update 3 as described in the Sitecore Experience Commerce Upgrade Guide. We will only concentrate on the engine upgrade and not the SXA Storefront upgrade. 2. Extract Sitecore.Commerce.2018.12-2.4.63.zip in a folder, I am extracting mine in c:\resourcefiles folder. stop the CommerceMinions_SC9 application pool. 9. If you have some customizations in the environment files like adding a new environment etc, please do a file compare with the new configuration files (Plugin. *.CommerceAuthoring-1.0.0.json, PlugIn.*.CommerceMinions-1.0.0.json,PlugIn. *.CommerceShops-1.0.0.json) and make appropriate changes. 10. Update global policy configuration: If you have made changes to the global.json file, please do a file compare with the global.json from the extracted Sitecore.Commerce.Engine.SDK.2.4.43.zip file and make appropriate changes. “Version”: “9.0.3” was added. 11. Disable the anti-forgery setting temporarily by setting “AntiForgeryEnabled”: false in \inetpub\wwwroot\CommerceAuthoring_Sc9\wwwroot\config.json file. Run SitecoreCommerce9.0.3_SchemaUpgrade.sql against the global and shared environment databases. Run SitecoreCommerce9.0.3_CleanParentIds.sql against the shared environment database. Run SitecoreCommerce9.0.3_BuildMappings.sql against the shared environment database. Run SitecoreCommerce9.0.3_BuildVariantIdsOnMappings.sql against the shared environment database. 14. Login to Sitecore, launch the Sitecore Installer and install the Sitecore Commerce Connect Core 11.4.15.zip package. Select overwrite existing files and Merge & Clear when prompted. 17. Delete contents of \inetpub\wwwroot\SITENAME\App_Config\Include\Y.Commerce.Engine folder. 20. 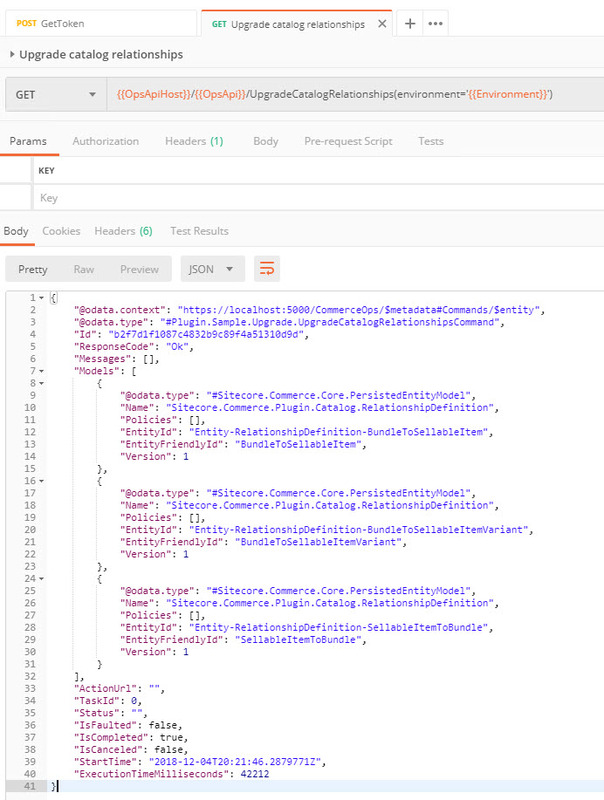 Make sure the information (especially the thumbprint) in the \inetpub\wwwroot\SITENAME\App_Config\Include\Y.Commerce.Engine\Sitecore.Commerce.Engine.Connect.config file are correct. Message: The certificate thumbprint is invalid or missing from your configuration, secure communication with the Commerce Engine is not possible. 22. Clear out all the collections from your Postman. 21. 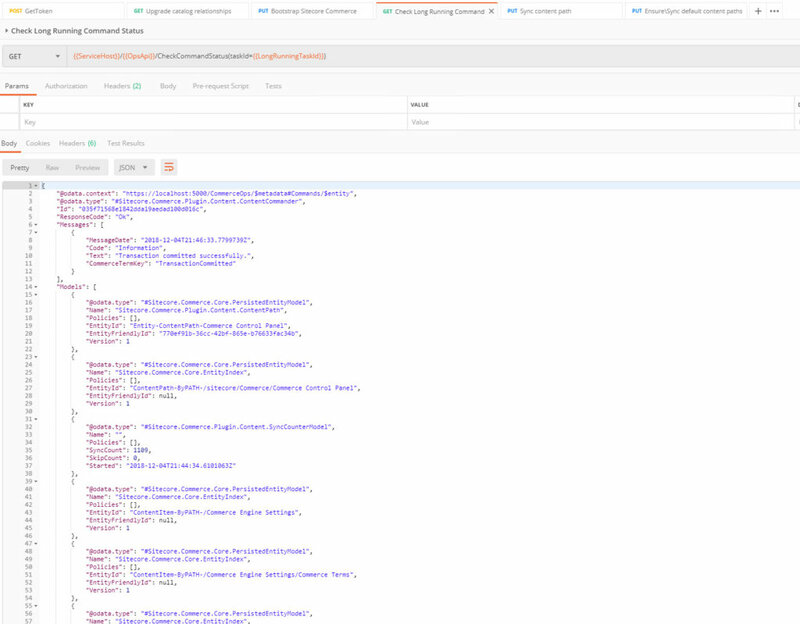 Import Postman scripts from the extracted Sitecore.Commerce.Engine.SDK.2.4.43.zip file. 22. Get token in Postman by opening the script from the Authentication folder. 22. 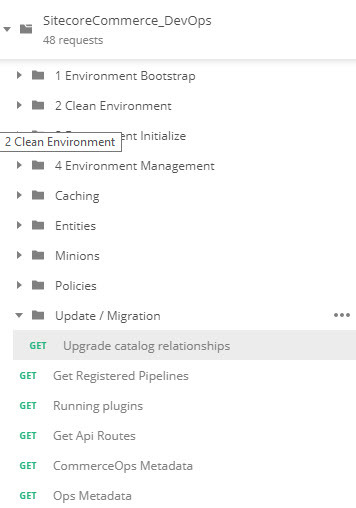 Open and run the Upgrade Catalog Relationships request from the Upgrade /Migration folder under SitecoreCommerce_DevOps folder. 22. Get token in Postman. 23. Bootstrap the Commerce Engine by running the script from the SitecoreCommerce_DevOps folder. 25. Synchronize Control Panel content Items: In my case I had not synchronized the Control Panel content items. So I ran the Ensure\Sync in the Environment Initialize folder in DevOps. Check the status by running the Check Long Running Command Status. 30. Login to Sitecore and do a full republish of the site (NOT SMART PUBLISH). 32. Enable the anti-forgery setting by setting “AntiForgeryEnabled”: true in \inetpub\wwwroot\CommerceAuthoring_Sc9\wwwroot\config.json file. Delete the contents of the inetpub\wwwroot\SitecoreBizFx\assets folder. Copy all of the files from the extracted Sitecore.BizFX.1.4.1.zip package into the inetpub\wwwroot\SitecoreBizFx folder. 34. Login to your Business Tool and confirm everything is working.